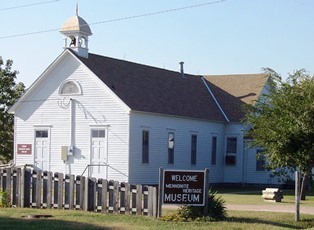 Eight building in a village-like setting tell the story of Mennonites who emigrated from teh plains of Ukraine to the plains of south central Kansas in 1874. A replica of the house where the first immigrants lived allows the visitor to get a glimpse into what life was like for the early settlers. Displayed in the Wheat Palace is the Wheat Straw Liberty Bell in its permanent home. The bell, made by Goessel area Mennonites, was commissioned by the Smithsonian Institute for display in Washington, D.C., from 1976-1978. Museum hours are March & April, October & November-Noon-4 p.m., Tuesday-Saturday and May through September from 10 a.m. - 5 p.m. Tuesday-Saturday. The museum is closed Sundays and Mondays, major holidays, and December through February except by appointment.